A radical experiment in do-it-yourself, jobless living. Photo: Mikey and Wendy. With the release of her new book, I decided to interview the author of the Good Life Lab, Wendy Jehanara Tremayne, about her do-it-yourself (DIY) journey with her partner, to live a more intentional, post-consumer life and be happier with less money. 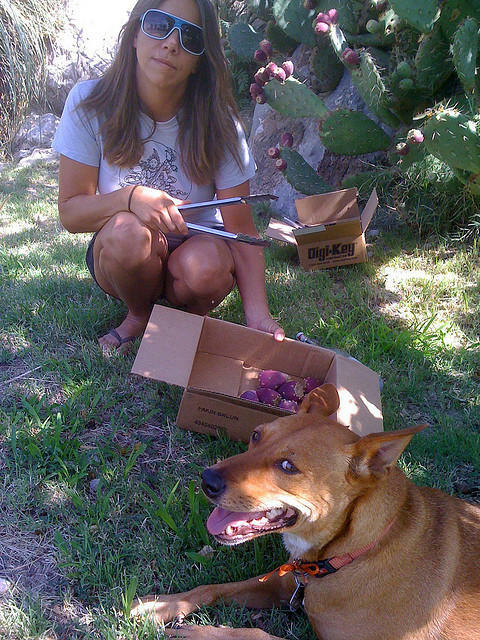 This inspirational story details how they gave up their high-pressured careers in New York City to make a better life in rural New Mexico, where they made, built, invented, foraged, and grew what they needed to live. Not having jobs meant more time to be creative and discover the abundance that already existed around them, even in the middle of a desert. 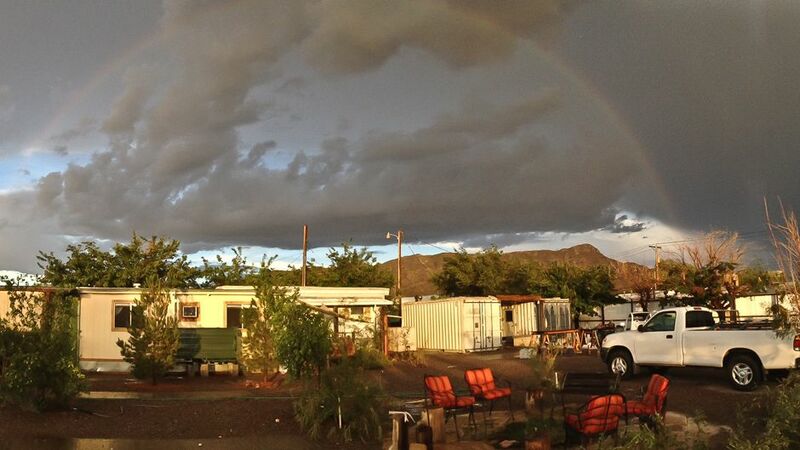 With no steady income and a small budget of US$10,000, Wendy and Mikey made their dream homestead come true by buying an old trailer park and reusing abundant local waste. Alongside their personal story are lots of practical tips and tutorials to guide you in your own journey towards a more self-sufficient life. More than just being a maker of stuff, through this book, Wendy re-imagines the American dream from its foundation with profound spiritual insight into freedom, a meaningful life, interconnectedness and relationship with nature. Wendy is also the creator of Swap-O-Rama-Rama, which is a model clothing swap that started from a Burning Man (an annual art event and temporary community based on radical self expression and self-reliance in the Black Rock Desert of Nevada, in the United States) grant and takes place in over 100 cities across the world, including at many Maker Faires. It includes a series of DIY workshops in which a community explores creative reuse through the recycling of used clothing. Instead of selling this viral event idea to the highest corporate bidders, Wendy made Swap-O-Rama-Rama a non-profit, Creative Commons project, free for anyone to replicate. What led you to this dramatic lifestyle change? Since grade school I have been aware that my life was consumer-oriented. I paid attention to the ways that money shaped culture. As I settled into my career, the American standard to grow ideas and turn them into profit wore away at me. I started to take inventory of what I was trading for money, things like time, energy, sleep, and less obvious things like maintaining artificial business relationships, lying for employers, doing things I didn’t believe in or want to do. Noticing that the best of myself, my creativity, I traded for money, I got fed up. What have been your biggest challenges and how have you dealt with them? One of the biggest challenges I faced was learning to say no to tempting offers. I received offers to commodify my projects and myself. For example, I made Swap-O-Rama-Rama so that I could offer an alternative to shopping. The green movement was just taking off back then and Swap-O-Rama-Rama was re-purposing textiles in cities all over the world. Corporations from car manufacturers to power companies have wanted to align with it to greenwash their image. It was hard saying no to six-figure cash offers and more than once these came while I had no other source of income. I had offers to do work that I believed in too, work that would ultimately be a distraction to what I set out to do. What have you enjoyed the most about the journey? The greatest reward has been reconnecting to nature. I used to think nature’s wisdom was an abstract concept. But once I took the time to reconnect to nature by slowing down, foraging, and growing I noticed that nature’s wisdom is real and tangible. Because we are alive we are able to intuit its knowledge. This happens through our senses and by connecting to life. In living patterns, activities, and cycles we connect to the common sense. In contrast, acculturated knowledge about the commodified world — things like banking, communication, and media — are not natural. We go to schools to learn civilization’s knowledge. This knowledge can’t keep us alive. It is not essential. People are meant to intuit the world. And I have found being able to causes us to feel calm, safe, and happy. 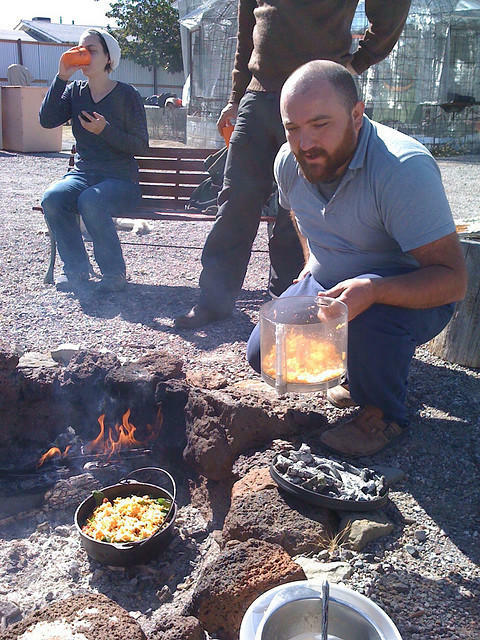 Skillshare party — learning to cook in a dutch oven. Photo courtesy of HolyScrap. Though my lifestyle seems to be about making what I once bought, about being a maker, it’s not really about stuff. It is about bringing stuff into our contemplative life. To learn anything we must consider what we trade and do for money. Being makers gives us insight because we have to follow materials, learn skills from people, and make discoveries, but ultimately that leads us to the real questions like who are we? What’s our nature? How can we do all this better? My advice is dive deep. A good contemplative question requires a lifetime to unfold. Savor it! While we’re all tied to this economic system we can start by simply inquiring. We can wonder about what an alternative to money might look like. What role has community played in your life and getting your needs met? The formula that I see working best is self-reliant people who share with one another = a stable and happy community. Money masks abundance. You can see this by noticing that the commodified world is a limited world. It is smaller than the real world. For example, civilization reduces infinite colors to the pantone color wheel, and unending shapes to the mason’s angles. It turns unlimited natural resources into scarcity by turning raw materials into product and leaving behind weakness in natural systems and waste. This artificial mimic world it makes has no life of its own so it uses ours to sustain itself. We call this employment. Money causes our lives to be an illogical patterned loop. We go to work to earn money to buy back the world that we already own, our birthright (the natural world), from the very same people who employ us. The abstracted world sold to us and made out of products causes destruction to our lives. When we reclaim our creativity, energy and inspiration we learn that we are unlimited and discover that we can build a world of our own design, one that is based on what’s actually true about life’s essential nature — it is abundant. 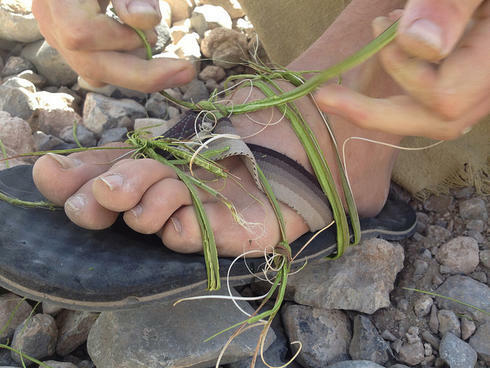 Fixing a busted flip flop on a hike with Yucca. Photo courtesy of HolyScrap. It seems like this choice took a lot of faith and trust in the universe, can you tell me about your beliefs? I trust myself because I see myself as the universe. The unique sensory set that humans carry has taken billions of years to evolve. Not just senses like sight, smell, sound, taste and touch, but other senses too like inspiration, ideas, creativity, impulses, and feelings. We are how the universe knows itself. There’s a saying: For transcendence, freedom is form. I have imagined that our collective senses make the common sense. I honor my response to the world and what my common sense tells me because I consider it to be the only real knowledge I have access to. I’ve always had the feeling that if I didn’t listen to it I’d be marooned. Can you tell me about your decision to not commercialize Swap-O-Rama-Rama? At some point it felt necessary that I prove my belief in abundance through action. This was right around the time I created Swap-O-Rama-Rama (SORR). Since SORR solved a real problem I knew that it was the right thing to make it easy for the world to adapt it. Money would have slowed it down. So when the event started to do well I knew I had to make it a gift. It felt great! Of course as soon as I gave it away I found another good idea in cue and realized that there’s no such thing as a last good idea. 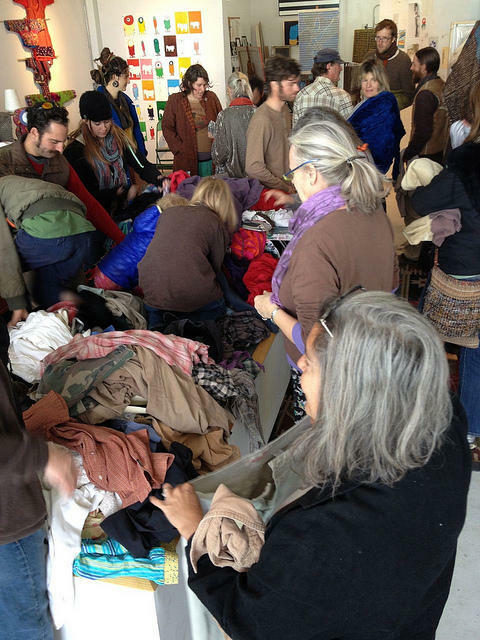 Wendy organizes a free community clothing swap in Truth or Consequences (a town in New Mexico) four times/year. Photo courtesy of HolyScrap. How have you learned the skills needed to survive so self-sufficiently? I make some stuff well, some OK, mostly though I am a generalist. What I am really good at is doing stuff that I don’t know how to do! I don’t think I could survive without others, thank goodness! How has the maker/DIY movement inspired you? It has inspired me but I also worry that it won’t get past being about stuff. Being about stuff does not really change the world. It’s the difference between a trend and movement. For example, I made a pledge to live on waste and this is not a solution. It does not escape the problem. People who were treated unfairly have made most of the stuff in the waste stream that I lived from, these are people who cannot afford to buy the things they’ve made. If we make the making of stuff contemplative then we get beyond the stuff and we reach the meaning. This is more exciting because we learn how the world really works and what is needed to repair it. This Creative Commons licensed post appears courtesy of shareable.net. A radical experiment in do-it-yourself, jobless living by Mira Luna is licensed under a Creative Commons Attribution-NoDerivs 3.0 Unported License. Based on a work at http://www.shareable.net/. Mira Luna is the Organizing Director and writer for Shareable.net. She is a long time social and environmental justice activist, community organizer and journalist, working to develop an alternative economy. She co-founded Bay Area Community Exchange, a regional open source timebank, the San Francisco Really Really Free Market and JASecon, and has served on the boards of the Board of the San Francisco Community Land Trust and the US Solidarity Economy Network (current).